1" 1-1/2" 3/8" 2" 5/8" 1-1/4" 1/2" 1/4"
we provide service of the whole process from designing to implementing. Factory supplier polyester double sided satin ribbon for package Our superior quality single/double faced satin ribbon at amazing prices! Lush satin ribbon, just like a premier ribbon company, is now available in 196 colors for all your favor and packaging needs. 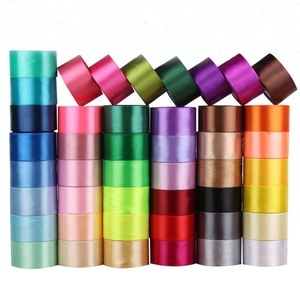 The richness of the satin ribbon colors will make it difficult to decide on what to select, but you can easily stock up. Shipping: Double Sided Satin Ribbon By air/sea/express, according to your requirement. Q: Are you a factory or trading company9 A: We are a factory for 10 years. 2). 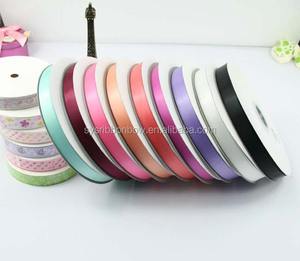 Double Sided Satin Ribbon Should you have any questions, please do not hesitate to contact me. Please choose the ribbon colour on our colour charts and tell us the width you are after. We can cut and heat sealed your printed satin ribbon to a certain length. Our custom printed satin ribbon are made to your specifications including logos, colors, and styles on your choice of fabric. We will choose the most suitable international express if your time is urgent or goods noe so heavy; B. We will ship goods by sea of by air if goods are heavy and deliver time is enough; C. We will ship goods to your warehouse if you have your own freight Payment: A. We are specialized in ribbons design ,development and production with advanced concepts and professional staffs. Committed to customers satisfaction 100% of products development and service concept. Market-oriented, take customer satisfaction as the criterion, to create high-quality ,good service suppliers of ribbon products. 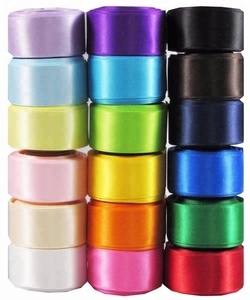 Alibaba.com offers 1,952 double sided satin ribbon products. About 54% of these are ribbons, 7% are gift ribbon, and 1% are lanyard. A wide variety of double sided satin ribbon options are available to you, such as 100% polyester, polyester / nylon, and satin. You can also choose from printed, embroidered, and jacquard. As well as from voile, organza, and grosgrain. And whether double sided satin ribbon is 1", 1-1/2", or 3/8". There are 1,949 double sided satin ribbon suppliers, mainly located in Asia. 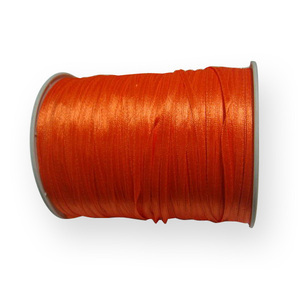 The top supplying countries are China (Mainland), United Kingdom, and Hong Kong, which supply 95%, 1%, and 1% of double sided satin ribbon respectively. Double sided satin ribbon products are most popular in Western Europe, North America, and Domestic Market. You can ensure product safety by selecting from certified suppliers, including 326 with Other, 217 with ISO9001, and 205 with BSCI certification.